I’m not sure if there are any bigger couscous fans than my family! They seriously could eat it every day if I would make it!! 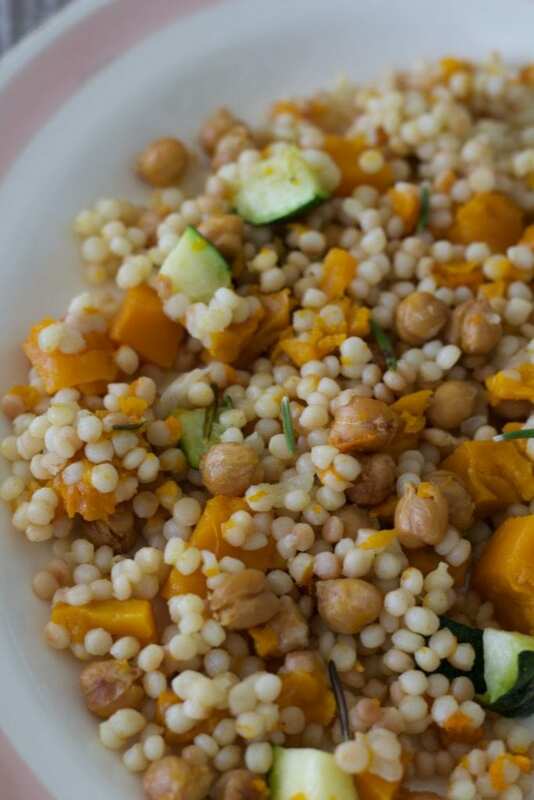 Our new favorite fall dish is this Israeli Couscous with Roasted Butternut Squash and Chickpeas! But guess what?!? I had another bowl of it today for lunch. I tossed in some small cubes of sriracha baked tofu that I picked up from Trader Joe’s (it’s highly addictive…I’m just warning you!) and had the most perfect vegan lunch!! Regular Couscous is made from semolina that is steamed and dried. Instant couscous is pretty familiar to many people. It’s so easy to put together! You just add boiling water to it and it set aside to let it swell up. Israeli couscous is also a type of pasta made from semolina and wheat flour. The couscous granules, larger than regular couscous and they sort of look like little pearls. I find that Israeli couscous has a chewy bite and also a nutty flavor that works so well with so many types of recipes. If you are a fan of butternut squash but are tired of only enjoying it in soups and your favorite ravioli, this is what you need in your life!! 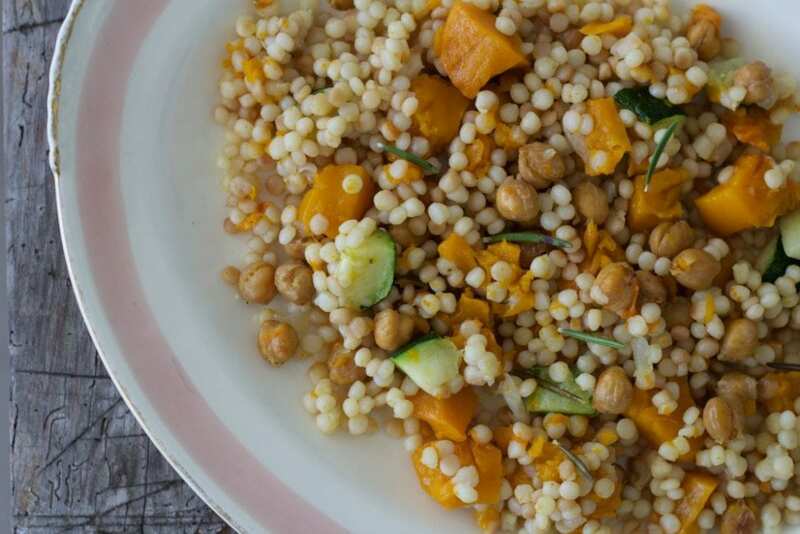 This dish pairs the lovely sweetnessTry this dish that pairs the of butternut squash and spicy roasted chickpeas with toasted Israeli couscous and a little touch of tender end of summer zucchini. A perfect side dish for the Thanksgiving table or any other roasted chicken or even baked ribs!! Here is another Israeli Couscous recipe I shared here (gasp! 5 years ago!!). 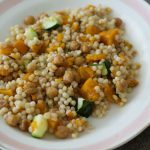 Roasted butternut squash and roasted chickpeas go so well the crunch of the Israeli couscous in this lovely fall dish that is vegan. Position a rack in the center of the oven and preheat the oven to 400ºF. Place the diced butternut squash on a foil lined baking sheet, toss in olive oil, toss on the rosemary, and sprinkle with 1 teaspoon salt and pepper. Spread squash out in an even layer. Top the squash with another sheet of foil paper and tuck in the ends to envelop the squash and not let out the steam. Roast squash for 20-25 minutes. Place the chickpeas on a baking sheet. Drizzle on a tablespoon of olive oil. Sprinkle on the ground cumin, cayenne pepper and 1/2 teaspoon salt. Toss it all around to coat evenly. Spread out the chickpeas and roast until lightly browned and crunchy, about 20 minutes. 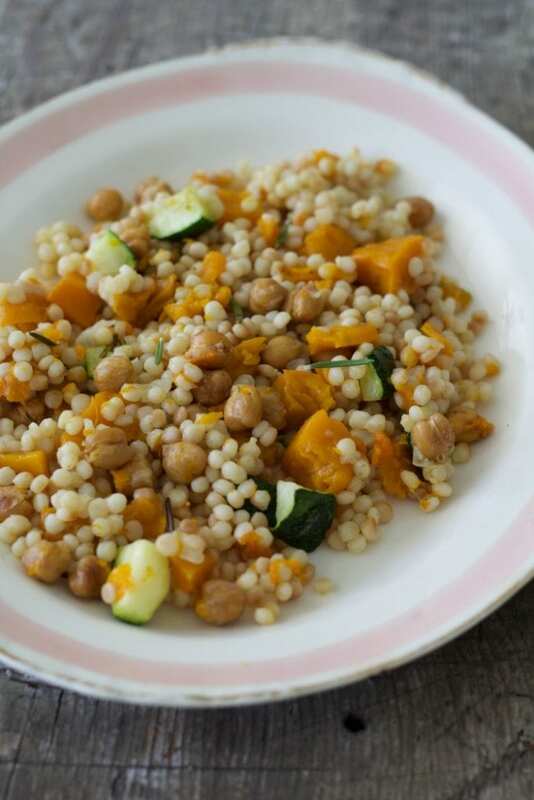 While the butternut squash and the chickpeas are roasting, prepare the pearl couscous. Heat two teaspoons of olive oil in a medium saucepan over medium high heat. Add dry Israeli couscous and minced onion. Toss on a teaspoon of salt. Stir frequently, cook until pasta has reached a toasted golden brown color, about 4-6 minutes. While you are browning the couscous, sautee’ the zucchini in a small frying pan until tender, remove from heat and set aside in a small bowl. Add 2 cups of water to the couscous a little bit of a time and bring to a boil. Keep stirring and adding couscous until all the water is absorbed. Check if the couscous is Cover and cook until all water is absorbed, about 10 minutes. When the water is all absorbed, check if it is too crunchy. If it is, add another tablespoon of water. Add another if it is still too crunchy. Remove from heat, fluff with a fork and allow to stand for 10 minutes. Add roughly one third of the roasted butternut squash, chickpeas and zucchini, stirring them into the couscous mix. Add the remainder of roasted butternut squash chickpeas and zucchini right before serving. Check the seasoning and add more salt and pepper if needed for your taste. This is absolutely perfect for fall! This sounds so yummy, I love this combo of ingredients! I am in heaven! Love that you've worked in butternut squash with the couscous. Can't wait to try this. I haven't cooked couscous before; you've inspired me to try! So beautiful and such amazing flavors. I wish I could have this for lunch today! This is a lovely dish..so perfect for fall. I hope you share it at our link party today, Dishing it & Digging it. The party starts 4:00 EST. I don't make couscous nearly often enough. This dish looks absolutely delicious!